If you have a lawsuit pending, and are struggling to make ends meet, lawsuit funding loans are an option to get your cash fast. The process typically includes a discussion with a lawyer, an analysis of your case, and if approved, a wire or check for your money in as little as 24 hours. Lawsuit loan approval is not contingent on a borrower's credit history. While there are many factors that can influence lawsuit funding eligibility, the main ones include the type of court case you have and the likelihood of winning the case or obtaining a settlement. The fees charged by the finance company are calculated by using a formula that involves a number of factors. Prime Case Funding (PCF) is a lawsuit funding company that promises quick turnaround on no-risk loans to clients currently involved in a legal action. If you're involved in a legal case and qualify for a lawsuit funding loan from PCF, you can expect to receive your money in as little as 24 hours. And if you end up losing your case, you don't even have to pay back the loan. The PCF website is just one example of the high level of professionalism you'll find at this company. Their well organized, easy-to-navigate website does an excellent job of covering just about any lawsuit funding topic you can think of. You can find answers to most, if not all, of your questions simply by browsing their website. We liked that it clearly outlines their lawsuit funding requirements and their four-step lending process. Prime Case Funding can issue lawsuit funding loans anywhere from $500 to $1,000,000 or more, in nearly all U.S. states. Their loans cover a wide variety of lawsuit cases, including civil cases, medical malpractice, wrongful death, false imprisonment, personal injury, and many more. If questions exist during any of this process, PCF employs friendly yet informative no-pressure representatives to assist and help step through the process. The company is also accredited with the Better Business Bureau and, at the time of this review, held their highest A+ rating. PCF makes their money by charging a percentage of the loan. Unlike most lawsuit funding companies, PCF freely provides some example rates and promises to offer affordable pricing. There are several factors that determine the ultimate cost of your loan, which include the size of loan, the type of case you have, the length of the loan, the state in which you live, and more. Prime Case Funding has an outstanding website, a strong history, fast loan turnaround, and an excellent customer service team. If you're looking for a lawsuit funding provider, they should be your first stop and they've earned our highest rating. Oasis Financial is a lawsuit assistance provider that issues non-recourse loans to clients who need cash now from a pending lawsuit. They offer funding for a variety of cases including auto accidents, construction negligence, wrongful death, structured settlements, civil rights cases and more. Oasis Financial is an Illinois based company in business since 2003 that offers loans between 10% and 15% of the projected case payout. The Oasis Financial website is professional looking and easy to navigate. For those that are new to the lawsuit funding arena, website visitors will find helpful links to review the difference between lawsuit funding and structured settlements, the qualification process, approval factors and much more. Submit your name, email and contact information using their online form or call them directly. Oasis will call you and the attorney to better understand the case. The lawsuit will be reviewed to determine if it meets Oasis' criteria which may require several pieces of documentation. If approved the money is wired, sent via Western Union, mail or overnight. Most payments are made within 48 hours or less. Customer service is responsive at Oasis Financial and that's evident in the "A" Better Business Bureau rating at the time of review. There is a toll-free customer service number, as well as an option to online chat with a service representative for any questions that may come up. Like all lawsuit funding companies, Oasis determines their charges and fees based on a series of factors associated with the cost. The only true way to determine the cost of the loan would be to submit the details and compare across the top companies reviewed. Overall, Oasis ranked high in our list of lawsuit funding companies. We like the strong history, prompt customer service team and wide variety of included case types. Oasis Financial is worth your consideration when looking for the best lawsuit funding option available. Law Capital is a legal funding service that advertises lawsuit advances for less. They promise low rates, fast service and deep pockets with loans available from $500 to $1,000,000.00. Law Capital is a Washington based company in business since 2003 that specifically works with personal injury, wrongful death, and workers compensation cases. We like the look and feel of the Law Capital website. It has a very professional appearance with a no frills layout. Available on the main page is the standard application box where prospective customers can enter their pertinent information to get the loan process rolling. Law Capital offers the usual frequently asked questions and testimonial pages, as well as links with details around Law Capital funding process and risk guarantee. The toll free number is listed at the top for any additional questions that may This company earned an impressive Better Business Bureau rating of A+. Apply, risk free, for the loan using Law Capitals online form. Law Capital contacts the client's lawyer to discuss the details of the case. They may also require some additional documentation. Risk is accessed by the company to determine fees/costs and eligibility. If approved the company will send a check via overnight mail or direct deposit. Law Capital does not stress speed like many of the other legal funding sites do but says the process can take as little as 24 hours. This is because different cases may require different analysis and their funding decision is "usually made within two business days" after they talk to the lawyer about the case. If you need money in 24 hours this may be a drawback of Law Capital, but otherwise we felt comfortable that there is a legitimate risk review happening here. This same philosophy applies to the rate and fees that Law Capital charges it's clients. Each case, it's duration, risk and type are different and thus the associated fees are specifically assessed for each individual lawsuit. However, Law Capital guarantees that it will "meet or beat any legitimate legal funding company offer" which is a guarantee we haven't seen with some other legal loan providers. Law Capital is an strong choice to consider for your lawsuit funding needs. A perfect BBB rating, simple process, detailed risk review and price guarantee pushed this company high on our list. The less urgent approach at Law Capital may be the only drawback for some that are in a hurry. Lawsuit Cash is a lawsuit loan provider that boasts a 12 year track record of providing legal funding to clients awaiting a lawsuit settlement. Customers will find at this website, the traditional non-recourse loans which are not required to be paid back in the event that the client loses the case. This company is based out of Indiana and has been in business since 2003. Notably, many people will recognize the name of the parent, First American Finance and take comfort in the A+ BBB rating. Start by submitting a rather detailed online questionnaire with contact name, details of the accident, case information and attorney contact information. 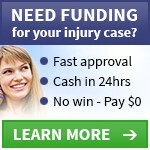 Lawsuit Cash will contact your lawyer to discuss the details of the personal injury case. They may also require some additional documentation. As with many lawsuit funding companies, the loan rate is based on several factors that may include case duration, amount of loan, risk of settlement and more. Lawsuit Cash clearly states that their costs are as low as 1.3% per month on settled cases, and 2.5% on pending cases, with an additional 15% origination fee and $250 fee for underwriting the loan. These fees are very competitive within the industry. We liked that Lawsuit Cash is backed by a well known, respectable company and holds an impressive BBB rating. The fact that loans are only available for limited case types means that many people will have to shop elsewhere. However, if you have a personal injury case in the works and need cash, Lawsuit Cash is a good company to consider. Litigation Capital Investors is a NJ based company that started in 1999 and has worked with over 10,000 clients thus far. They're a legal loan provider that seems to focus on personal injury cases. The main page of the website asks "Were you injured in an accident? We can help!" The website for Litigation Capital Investors is very simple and formatted like a legal sheet of paper. The website is a bit outdated but provides most of the basic information you need to move forward. First, you apply via their short online information form. After a phone call with you to confirm basic details, the company will discuss the case with your lawyer. Once LCI has reviewed the case and determined the respective fees, they send you the formal agreement to sign. When they've received the signed documents from you, Litigation Capital Investors will send a bank wire or check via overnight career within 1 to 2 days. The company does state that they generally work with cash advances between $2,000 and $20,000, but they can go higher. They typically loan between 10 and 20% of the projected payout. Unlike so many other legal funding providers, Litigation Capital Investors publishes their rates for their "Preferred Case Funding" program. To qualify, you must have been severely injured in accidents where there is liability and adequate insurance coverage by the defendant. Their rates of 1.25% per month simple interest, plus an 18% administrative fee, are among the lowest we've found. This is a good indication of the type of rates you might expect from them for other types of cases. Litigation Capital Investors also features a Best Deal Guarantee. If they approve your application for an advance, and another legal funding company offers you the same amount at a lower rate, they will beat that deal or pay you $250. While Litigation Capital Investors focuses on accident cases involving injuries of some sort (such as motor vehicle, dog bite, slip and fall, and nursing home negligence), they offer very competitive rates, 20+ years of experience, and an impressive A+ BBB rating. If you can overlook their outdated website, you'll find that Litigation Capital Investors is worth your consideration. Lawsuit Funding is a legal loan service that provides non-recourse cash advances for clients who have legal expenses they need to pay. This California based company has been in the business since 2001.We really liked the Lawsuit Funding website but after research found it to be a bit lacking in information. Also, despite several attempts we weren't able to find any mention of this company at the Better Business Bureau, for a company in business since 2001 that was out of the ordinary. Complete online form with contact information and general details. Expect a phone call from a representative. Lawsuit Funding contacts yours lawyer to discuss the details of the case. They may also require some additional documentation. Lawsuit company will analyze the case and determine eligibility and associated cost. Lawsuit Funding's website has fewer details and educational information than all companies ranked higher. They do not publish the loan sizes they work with but they do appear to accept many types of cases. This is a professionally organized website but at times the links and details were missing. The website indicates that you customers can have funds in as little as 24 hours, but there is no guarantee of that and no specifications around what you need to do to get the money that quickly. As with so many of the other legal loan providers, Lawsuit Funding does not provide a schedule of rates and fees. However, this is typical given that the fees and interest rates are determined by a number of factors unique to each case. There are some positives to considering Lawsuit Funding, but they fall short of our top reviewed legal loan providers due to the lack of BBB accreditation and listing and the website that wasn't consistently working nor packed with much information. Cash 4 Cases is a legal funding website that offers non-recourse loans to clients that are involved in a personal injury, commercial lawsuit, or malpractice lawsuit. They promise an easy application process and rapid funding of funds if approved for a loan. Cash 4 Cases has been in business since 2007 and is a NY based company. There is nothing remarkable about the Cash 4 Cases website that would set them apart from the masses of legal funding providers. The main page displays the toll free number, a brief description of the loan application process, and links to the usual FAQ and company history pages. There is an application box where loan seekers can input their information and start the loan process. There is a link to a testimonials page that contains a total of 8 reviews from clients, all positive of course. There is no notice of Better Business Bureau accreditation or links to any independent reviews or social media pages. However, after searching the BBB website, we found that this company does currently hold a non-accredited A rating. The loan process is similar to other legal funding services. The application is completed by the prospective client, Cash 4 Cases contacts the attorney to review the case and determine risk, and then if the risk is acceptable Cash 4 Cases mails the check to the client. The timing of this process, however, was a little unclear with Cash 4 Cases. On the main page it claims "funding in one hour or less, guaranteed" but then there is an asterisk that cautions "restrictions apply." Searching the website there was no more information on this supposed guarantee and in fact were statements that said such things as "Upon approval of your lawsuit cash advance application, you can receive your check as soon as the following day. "That statement makes it sound like it could be later than the following day as well, and certainly not in under an hour. Unclear and irresponsible promises at Cash 4 Cases pushed this company low on our list. Additionally, like most lawsuit funding companies there are no rates or fees available for review on the website. This means, customers will have to submit information and be contacted by one or more loan officers before determining the costs associated with payment. The website, which makes many other promises, says their rates are among the lowest in the industry ranging from 1% to 3%. Despite a good BBB rating, we couldn't get excited about Cash 4 Cases once we found empty and confusing promises on the website. This website appears to take a used car salesman approach to a serious and potentially expensive situation. We recommend you look higher on our list of lawsuit funding companies. Any Lawsuits is a service that provides loans to clients who are involved in a lawsuit and anticipating compensation. Any Lawsuits provides "non-recourse" loans to anyone who qualifies, which means if the clients loses the case no repayment of the loan is required. The Any Lawsuits website itself is very simple and easy to navigate. The main page outlines the two main reasons a person might need a lawsuit loan; the need to pay for ongoing fees while waiting for a settlement, and the need to hire a legal team in the case where the client is the plaintiff. Any Lawsuits states they work with a variety of lawsuit types including breach of contract, malpractice, personal injury and more. There is a toll free customer service number, a link to an FAQ page, and a brief summary of the loan process which is all pretty standard. What is missing is detailed information about the company - important information to have when choosing a lawsuit funding company. The process for obtaining a loan from Any Lawsuits is straightforward. There is a short loan application to fill out, and when this is submitted a representative from Any Lawsuits will call the prospective client within 24 hours. With the client's permission, Any Lawsuits will then contact the client's lawyer to discuss the details of the case. A risk analysis of the case is then performed, and if the case is deemed an acceptable risk, a loan form is presented to the client for signature. Once signed the client receives the non-recourse loan check within 48 hours. The BBB has no rating on this company but believes this company is out of business, at the time of our review. As mentioned, similar to all non-recourse lawsuit loan services, if a client loses their case they do not have to repay the loan to Any Lawsuits. If the client wins the case however, the loan is repaid in full along with a fee. The fees charged are based on several factors including loan duration, type of case and more. Outside of lacking company information, we were specifically concerned that the Better Business Bureau believes this company is out of business. We called their toll free number and they answered but this is not consistent with a long standing, reputable company and put up a red flag for us. Some of the factors that affect the fees you're charged by the finance company include how soon your lawsuit case will settle, the likelihood that you'll win your case, the state in which you live, and more. The good thing about lawsuit funding is that if you lose the case and any potential settlement money, you typically don't have to pay back the loan. History. How long has the company been in business? What is the Better Business Bureau rating for that company? Professionalism. How informative and professional is the company? Can you easily find the information that you're looking for? Turnaround. Many companies promise quick turnaround on loans. What is the anticipated turnaround timeframe on obtaining a lawsuit funding loan? TopConsumerReviews.com has reviewed and ranked the best lawsuit funding companies available today. We hope these reviews help you find the best service to meet your financial needs!